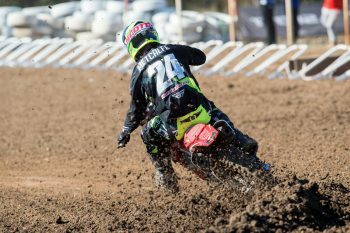 Despite finishing runner-up in Sunday’s ninth round of the Pirelli MX Nationals, Brett Metcalfe has revealed an illness hindered his performance at the Gladstone venue. The Penrite Honda Racing rider was extremely competitive in the opening 16-lap encounter, setting the fastest time on his way to second place behind Dean Ferris (CDR Yamaha Monster Energy Team), finishing 4.567s behind the newly-crowned champion. Returning for race two, the South Australian admits his lack of energy resulted in being unable to challenge in the lead group, ultimately settling for fourth before being promoted to third following Mitch Evans’ (Raceline Pirelli KTM) two-position penalty. “Having kids leaves you susceptible to getting colds and I was concerned when I came down with this one, that it may affect my performance,” Metcalfe revealed. “It’s lingered for over a week and definitely impacted my weekend. Our lap times improved as the day went on and I am very pleased to come away with second place. “Moto one was good and bad, I wanted to win and I pushed several times for the lead but there were limited areas to pass and I had to settle for second. I want to congratulate Dean on the championship, he has ridden well all year. Suffering a host of DNF results in the early stages of the championship, Metcalfe has impressively worked his way to fourth in the standings, and still has a slim chance of earning a top three placing when the series concludes this weekend at Coolum in Queensland.